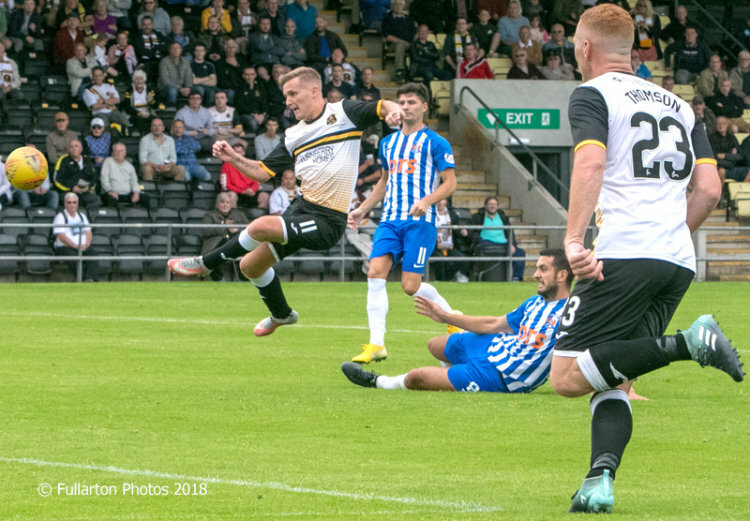 DESPITE a brave display, and leading twice in an end-to-end game, Dumbarton ended up losing 4-2 to Premiership side Kilmarnock in the Betfred Cup group H tie at the C&G Systems Stadium. Kilmarnock pressed from the outset, but Sons showed good physical presence. Andy Dowie, in particular, made several important tackles to thwart Killie attacks which were persistent but rarely potent. Then on 41 minutes, and completely against the run of play, Craig Barr adroitly nodded home a superb Michael Paton cross from the right to give Dumbarton the lead. It took Kilmarnock just three minutes of the second half to get back into the game. Mikael Ndjoli had been a threat all afternoon and got on to the scoresheet with a clinical finish into the far corner to make it 1-1. On the hour Sons were millimetres away from leading again when Paton's teasing ball to the back post was helped back across by Thomson before hitting Stephen O'Donnell. But keeper Jamie MacDonald just gathered on the line. A great dummy from sub Rory Loy, making his Sons debut, and a fine finish from Bobby Barr (pictured) gave Dumbarton the lead again five minutes later. But Killie came straight back. On 68 minutes sharpshooter Kris Boyd equalised for the visitors as he made the most of a loose ball in the penalty area. Eight minutes later Boyd headed the Rugby Park side into the lead for the first time in the afternoon. Boyd secured his hat-trick to finish the game off at 4-2 just before the final whistle. But it was still a spirited display by Sons, who were finally undone by top class finishing.